Giải pháp của chúng tôi hoạt động như thế nào? Chúng tôi cung cấp những gì? DataPLUS là một mô-đun dữ liệu bổ sung cung cấp dữ liệu ăn mòn, thông tin vật liệu, kích thước vật liệu và dung sai và thông tin lớp phủ cho hàng ngàn vật liệu kim loại và phi kim loại. Total Materia đã cho phép chúng tôi giải quyết một cách chắc chắn tất cả các vấn đề chúng tôi thay vì phải tìm kiếm các tài liệu thay thế ở nước ngoài. Nhờ Total Materia, chúng tôi đã ban hành các thông số kỹ thuật "quốc tế" thực sự để mua thép ở nước ngoài. Total Materia là công cụ duy nhất sẽ được sử dụng cho mục đích này. 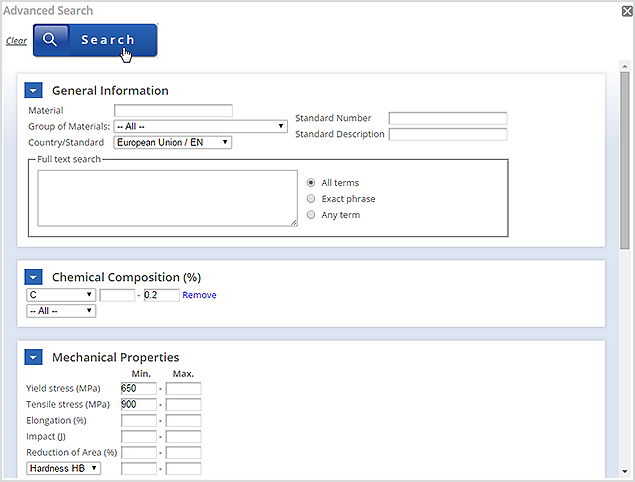 Total Materia's advanced search allows for a whole range of search criteria to be specified to help find a targeted list of materials according to the intended application. Combination of several elements can be given as a search condition, and it can be combined with the other criteria, to select the material that exactly matches your requests. 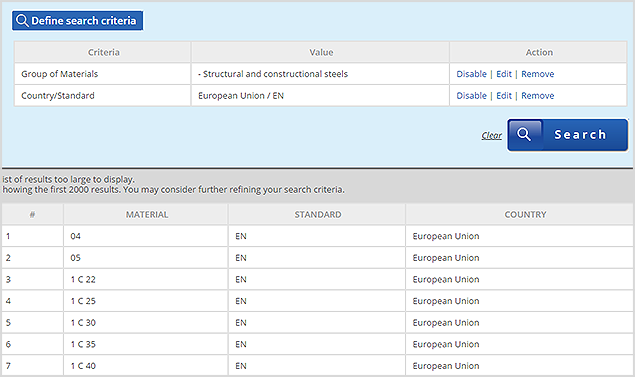 Suppose that you want to select a European EN steel with some specific criteria relating to composition and mechanical properties. To begin, click on the Advanced search button to see the available search options in an intuitively laid out form. To define the search criteria you can select EN from the country's pop-up list. To define chemical composition criteria check C, thus enabling fields for values. Then enter 0.2 for maximum C value. In order to define yield stress and tensile stress values enter 650 for minimum yield stress value and 900 for minimum tensile stress value. 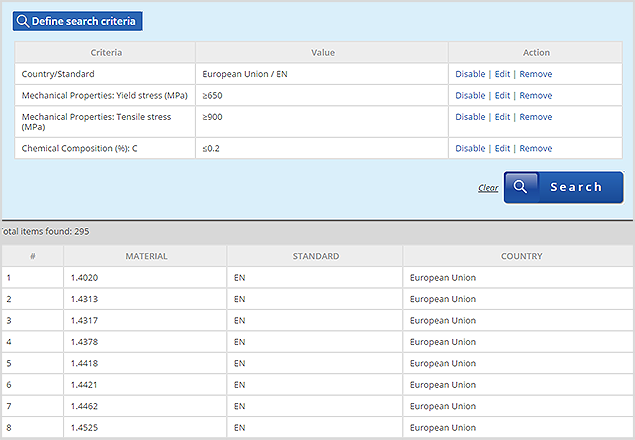 After you click the Search button, Total Materia will find all European materials that fulfil given criteria and display them in the list. You will also notice the selected search criteria at the top of the page which allows editing and subtle adjustment of the advanced search simply. An example of this adjustment would be to narrow the materials with yield stress to a certain temperature range. 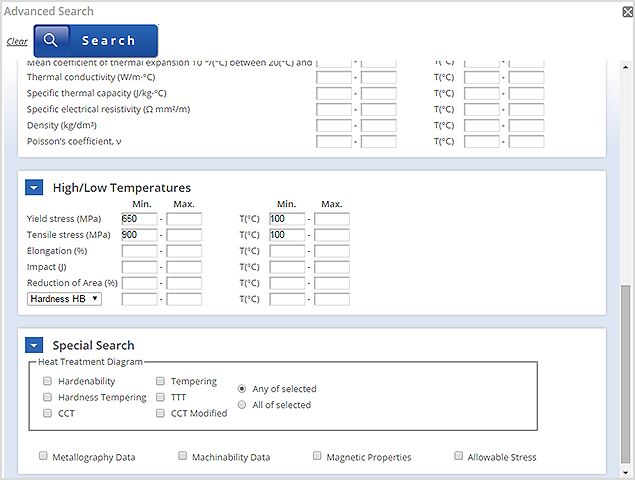 To do this you can go back into advanced search, add the temperature range and then click search again. Selecting materials by country and group generally results in a list of materials that satisfy criteria you gave. Depending on given criteria, this list can be quite large (up to 2000 materials), so it is displayed in pages. By using navigation buttons, you can navigate through the pages, jump to the beginning or the end of the list or go to a specific page. If you are interested in properties of some specific material from the list, you can click on its designation. © 2019 Key to Metals AG. All Rights Reserved.